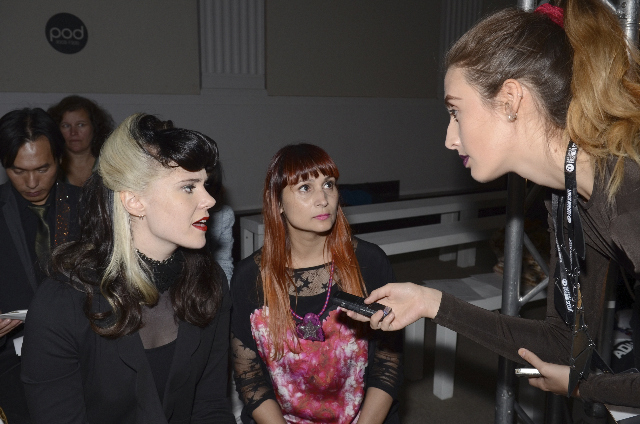 Vauxhall Fashion Scout were lucky enough to speak with familiar faces Rebekah Roy and Kate Nash in the front row at Ji Cheng. I’m wearing Ji Cheng today, I’ve just discovered her stuff - I love it. I don’t really know what to expect from the show though, only good things though! I think it’s really beautiful, right down to the invitations and the tea on the floor. London is really nice in that it is really multicultural and embraces loads of different cultures; anything can be inspiring, so the more you’re exposed to things that are unlike what you know, the better. I completely agree. A lot of the fabrics she uses, the way she layers the fabrics, and a lot of the lovely little details she uses are wonderful. We don’t live in a void, and with fashion we really don’t want to. Ji Cheng is a huge designer in China, but when she comes here it’s like she’s starting again: that is the flip-side for when someone starts. There’s a huge market for Chinese designers to come to Europe and to England. Super-brands have been going to Asia for quite a while, so it’s about time that we see the reverse happen.